Details Our French ocher is from the ocher deposits in the French quarries of Gargas and Rustrel nestled in a 12 mile long enclave in the heart of the Luberon Massif, the ocher country. Ocher is a symphony of colors ranging from pale yellow through the orange range to an intense red. It has two major characteristics: it never fades in daylight and the color is highly concentrated. 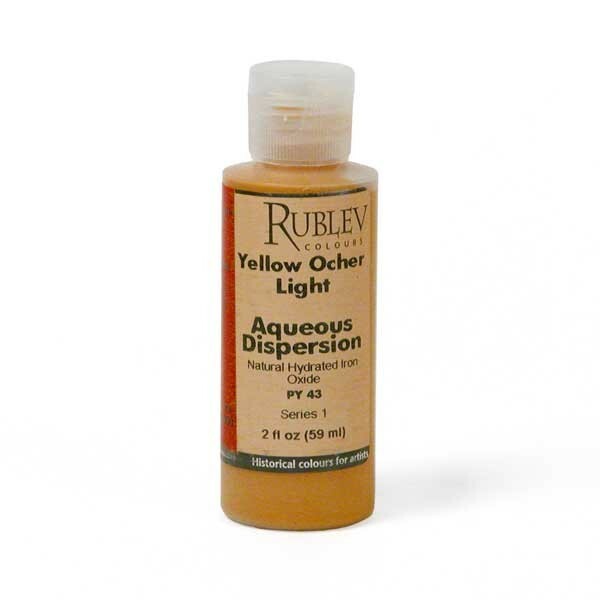 Rublev Colours Aqueous Dispersions are pigments dispersed in water ready to be mixed with water-based mediums. These dispersions are especially made for use with traditional painting mediums, such as egg tempera, casein tempera, fresco, watercolors and distemper (glue tempera). They are also ideally suited for use with gesso to make toned grounds for drawing and painting. Pigment dispersions from Rublev Colours contain only naturally-derived ingredients, in addition to pigment and water, making them ideally suited for traditional mediums. Unlike other pigment dispersions that are typically made for acrylic medium, Rublev Colours Aqueous Dispersions do not contain coalescent solvents, artificial dispersing resins and other additives that interfere with natural mediums. Aqueous Dispersions make preparing traditional mediums easy; you do not have to hassle with powders, grinding pigments in medium and calculating binder ratios to make water-based paint. They make adding the right amount of paint binder, such as egg yolk, a no brainer because the right amount of water is already contained in the dispersion, simply add egg yolk. Alternate Name: Mars yellow is the name given to the synthetic form of yellow iron oxide hydroxide. Known since the antiquity, ocher (okhra, Greek) occurs naturally as yellow ocher (limonite) or as red ocher (hematite). Ocher has been used as a pigment since prehistoric times and is perhaps the most widely used pigment for artists paints. 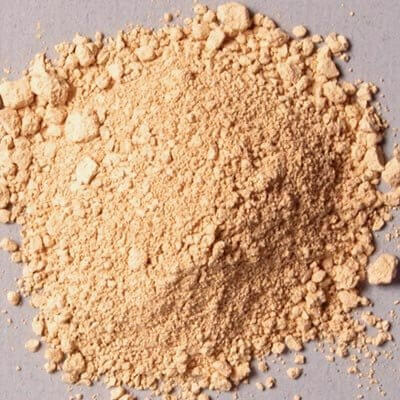 Yellow ocher is a natural earth containing clay tinted by hydrous forms of iron oxide, such as goethite, and traces of gypsum or manganese carbonate. Historically, yellow ocher was designated by the mineral name limonite. Limonite, however, is not a true mineral, but a general term used to describe all forms of hydrated iron oxide minerals (α-FeOOH) that occur as natural earth. Limonite includes the minerals goethite, akaganeite and lepidocrocite. To be considered an ocher, the content of iron oxide must not be less than 12% with varying amounts of kaolin and quartz. Depending upon the content of hydrated iron oxide, the color of ocher varies from light yellow to golden. Like red iron oxides (hematite), they are found around the world and have been used as pigments since prehistory. 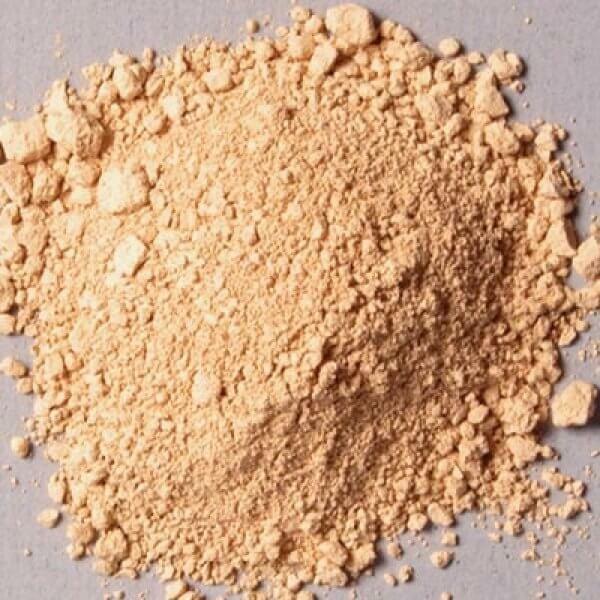 French ocher, historically one of the best grades of ocher, contains about 20% iron oxide and is high in silica. Ocher grades into sienna, a yellow-brown pigment containing a higher percentage of iron ore than ocher as well as some manganese dioxide. Sienna grades into umber, which is darker brown and contains a higher percentage of manganese dioxide. Burnt sienna is brown or bright red, burnt umber is a darker brown than umber. Extract ore from the quarries. Separate ocher from sand using water and centripetal force. Blend different ocher extracted from diverse veins to obtain the selected colors. Grind to 50 microns and pack. Ocher is among the most permanent colors among the artist's palette. It is compatible with all other pigments, and can be used with good results in all mediums. Ocher absorbs a moderately high amount of oil. The oil absorption ratio is 30–35 parts by weight of linseed oil to 100 parts by weight of pigment. If the measurement were grams, this pigment would require 30-35 grams of pigment to grind 100 grams of linseed oil to form a stiff paste. It slows the drying of oil paint, but forms a good film. Ocher is not considered toxic, but care should be used in handling the dry powder pigment to avoid inhaling the dust.